In this latest edition of the “Why I Bought It” series, I hope to give you a good impression about why I chose this watch among the many ultra-complicated chronographs out there, why I’m still pleased with my purchase three years later, and what you might want to consider if you think that this stalwart of the Lange line could be the one for you. Gary, I just have to reiterate how superb these photos are! Bravo! Thank you so much, Elizabeth! I recently spent a half-day in my home photo “studio” working in person with my photography teacher, the great Ming Thein, and I thought the improvement was immediately apparent but wanted to see what others thought! This is the story I’ve been waiting for! The thoughts behind the purchase are a major driving factor in my love of watches, and reading both your opinions and story behind the DS was a true pleasure. I find it fascinating how Lange can create such a technical masterpiece, yet design it in such a way that allows it to remain stealthy to all but a few.. until you turn it over of course. Excellent photos, I love the brooding giant shot near the end. This is one which has grown in popularity since its introduction don’t you think? Even more-so after the Pt version was discontinued. One I have wanted to handle for years, but only lucky enough to see the RG version. Glad you enjoyed it, Colton! I agree that this watch has grown in popularity over time, and perhaps even more so since the PT version was discontinued. I have to give credit to my friend and fellow Double Split owner Edwin H. for helping to popularize this watch, and hope that over the past few years my words and photos on this piece have helped to fan the fires as well. You can expect to see more on Lange from me in the future, to be sure! Thanks for sharing, Lovely photographs! 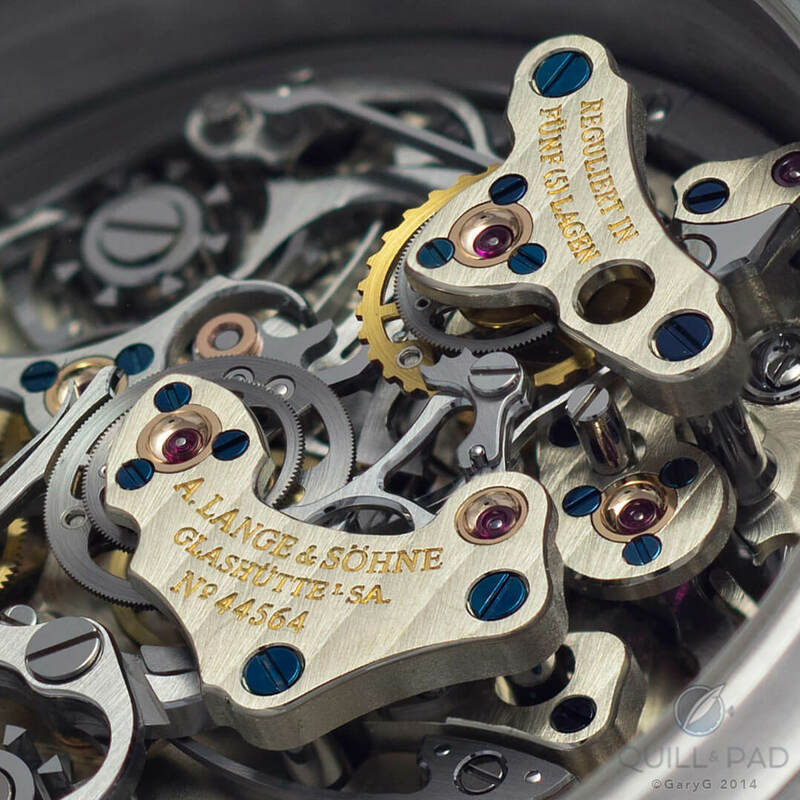 I love A. Lange & Sohne, I think they are the best watchmakers on the planet. This piece is a triumph of mechanical engineering. Thanks for explaining how it works. Alas, I can only admire from afar. Thanks for taking the time to comment, Richard! As you can tell, I am a big admirer of Lange myself, and of this piece in particular. Thanks also for the kind words on my photos — I am enjoying macro photography more and more, and will be sharing many more photos on Quill & Pad in the coming months. Amazingly enough, Imran! I’ve talked with some PP and VC devotees who make much of those brands’ more “horizontal” chrono constructions. I have to confess that those are beautiful as well, but for me it’s deep dimensionality every time. Completely agree that the DS is one level over and above the Dato, which could hardly be believed if you had only seen the latter! Thanks for your note — I’ll hope to see more comments from you here in the future. Could you please explain further how “one of the great things about these sorts of watches from a collector’s perspective is that they allow you to spend (note I didn’t say “invest”) more on your collection than you could otherwise afford”. How does one actually do that? Either one has the money to purchase the piece (investment grade or not) or one doesn’t. Is there anything I am missing here? Certainly eager to better understand, as I suspect I might have more than a few things to learn from you! P.S. Gorgeous watch and very skillful, crafty photography! Thank you for the awesome shots of a stunning piece! I’m planning a longer article on this sometime in the next months, but if most of one’s collection is made up of watches with established and stable values on the pre-owned market it should be possible to build a fairly large collection while limiting the downside risk on valuation. For instance, the value of the Double Split at auction and in private sales among collectors has been flat to slightly up over the past three years — so if I sold my piece now, I’d get out with zero “spending” and would have had three years of wearing enjoyment. When I say “afford,” I’m not talking about having the funds to buy the watches — I’m talking about the net loss that one takes during the period of ownership. Hope that clarifies it at least a bit! Thank you for this. This is indeed a perfectly clear response. In other words, what you mean is that if you pick and choose your watches correctly, you are basically getting them loaned to you for “free”, so all you lose is the value of the inflation over the amount spent, the liquidity of the amount spent, and the potential ROI on that money that you spend on the watch. In your opinion, would a recent Audemars Piguet Jumbo (15202) belong in this select category of watches, or would the depreciation on it be too much for it to belong in there? Thank you again. It is great to have people with so much experience sharing it so clearly with the public in this manner! My pleasure, Claude! It’s great to hear that the “collector” perspective that I bring to Quill & Pad is useful to you. Sad to say, I really don’t feel qualified to give an opinion on the Jumbo, as with the exception of one Jules Audemars watch I’m not a collector of the AP line. My advice to you would be to go to a couple of the big online watch forums and look at the asking prices for these watches over the past several years — that should give you a sense for how the pre-owned pricing level has moved, if at all. Overall, though, once a version of a popular watch line (with the Royal Oak as a pretty good example, and the Rolex Daytona maybe even better) has established a trading value, it can indeed be stable over time — I just don’t want to lead you astray on this particular watch, as it wouldn’t be my money on the line! Nice article Gary! Having recently bought my Platinum DS I can certainly vouch for all the comments you made. It is indeed ” mighty”! The interesting thing is watching people’s reaction to it. Even those that perhaps are not so horologically inclined, seem to fixate their gaze on the watch when I wearing it! I guess the sheer presence of the watch does beguile some people. But as you have a stated above it is a wonderful watch and I’m very pleased with my purchase. Many congratulations, Alex! I agree — this is a watch with real wrist presence that draws (the right kind of) attention, even from people less-obsessed with watches than we are. I hope that you continue to enjoy wearing your Double Split; it certainly maintains a regular position in my wearing rotation, and I always smile when I see it on my wrist. Superb article! DS has always been one of my holy grail watches. Can you tell me if the brown watch strap you have on your DS is a Lange strap or did you purchase elsewhere? The strap you see is actually one of the Santoni straps made for IWC and available through the IWC boutiques. Happily, the width of the strap at both the lug and buckle ends matches the Double Split’s dimensions — and that “antiqued” brown look is, to my eye, just killer with the black/white contrasts of the watch and touch of yellow patina on the DS dial. No worries! Thank you for your response. I completely agree with you. It is a wonderful watch, which I found when discussing Zenith Rattrapante at the Watchuseek forum (http://forums.watchuseek.com/f27/zenith-rattrapante-kinds-uses-3728458.html). Absolutely, the best article about the mighty Double Split on the internet. This is probably my sixth or seventh time reading this, and it’s equally impressive each time. When I took the double split in my hands, I appreciate even better, thanks to your photography and article. Thanks very much, Alp — I’m tremendously pleased that you enjoy the words and photos enough to keep coming back!